Sikkim- A Look Back View: How cognizant are we to preserve our Heritage? How cognizant are we to preserve our Heritage? We cannot live by History, we cannot ignore it either. It seems that Sikkimese populace will never appreciate this saying. The heritage of our state is always neglected by our people who are acquainted to live in the modern acquisitive world. They have almost forgotten the fact that our roots are somehow connected to our past and we need to preserve them to keep our glory alive. It is the tale of a Foundation of an almost forgotten figure of Sikkimese politics Late Kazi Lhendup Dorjee Khangsarpa, who once had single handedly driven the entire politics of Sikkim. He was not only the first Chief Minister of Democratic Sikkim but can also be regarded as the father of Democracy in Sikkim. In the heart of the Capital City and in between the fresh and stunning edifices there lies an old House related to this founding father of Democracy. Situated on the back side of the very famous Bansilal Petrol Pump at the busiest place of Gangtok, the structure is at its brink of decay. In an old signboard it is written as L.D. KAZI FOUNDATION and is locked since a long period. Though, it is situated in the heart of Gangtok none of the enlightened eyes have ever bothered to speak something about this old structure. It is to be mentioned here that this structure is probably the only part of a set in Sikkim allied to Late Kazi Lhendup Dorjee. I have seen this construction since my childhood at the very same condition and even today while coming to Namchi I do have a glimpse or twice to this old House. 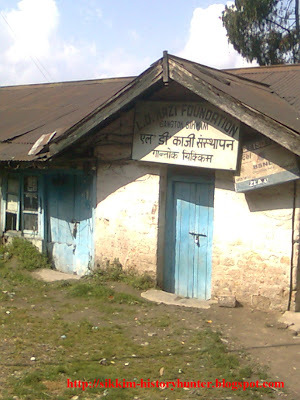 I do not have much information about the year of its construction and about its proprietor, but, I definitely can say that it is related to the First Chief Minister of Sikkim and is totally in an abandon condition. We consider tourism sector as the major source of income in our state and accordingly it has played a vital role for strengthening our State’s economy. But, what kind of impression the structure is leaving among the eyes of the tourists is another topic for discussion. 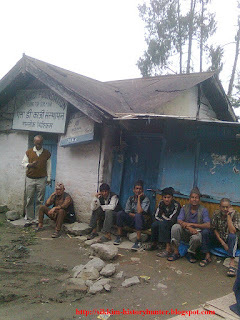 A place that is associated with the Father of Democracy in Sikkim has now become a rest house for the immigrant Nepali coolies, who are spending their leisure time in listening Lok Dohori on their cell phones. Once I have posted a similar article entitled PARADISE LOST on my blog and that too was associated with the conservation of monuments in Sikkim. I should consider myself as the luckiest fellow that I had been able to take some pictures of Rani Khola Bridge at Ranipool. Now a day, the said bridge has been dismantled and nobody objected to this act as they all are adapted in living with the present. In the case of L.D Kazi Foundation too, I am very much sure that this structure will be demolished in a near future and it will be replaced by some modern edifices. The main reason for the abandonment of a place with such historical importance is that our people have developed an attitude of “Nothing is there in Dead Past”. Further, the youths are always busy in gaining political favors from their concerned Political Parties. Similarly, the unemployed people with higher degrees are waiting for their fortunes and the most enlightened section of the society, i.e. the bureaucrats have parallel themselves with the Terminators and finally, the villagers who have nothing to do with this. Under such a situation where people are busy in their own way, places like L D Kazi Foundation, Rani Khola Bridge, Rorathang Mining, Lingtam Dak Bungalow have probably meet an untimed downfall. Being a student and a lover of History, I would like to plea the State Government and the Department to take some strong measures to protect such places. If the Foundation is a private property then the related Department for the conservation of such monuments should provide financial support for its renovation and if it is directly associated with the Department and if the said Department cannot handle these monuments, they should hand them over to some other higher authorities to protect and preserve them. If they will not be protected in time, then our history in the coming years will be almost analogous to those of Jawara tribes of Andaman and Nicobar islands.